Artist Cornelia Kubler Kavanagh is passionate about exploring the ocean’s great unknowns. Via her latest work, she has found a kindred spirit in Gareth Lawson, a biological oceanographer at Woods Hole Oceanographic Institution. Their unique collaboration, “The Pteropod Project: charismatic microfauna,” features a series of Kavanagh’s aluminum and bronze sculptures of mostly microscopic sea snails that float freely in ocean currents. Because pteropods also swim by flapping two wing-like lobes called parapodia, they are often called sea butterflies. The exhibit opens in Manhattan’s Blue Mountain Gallery in May. 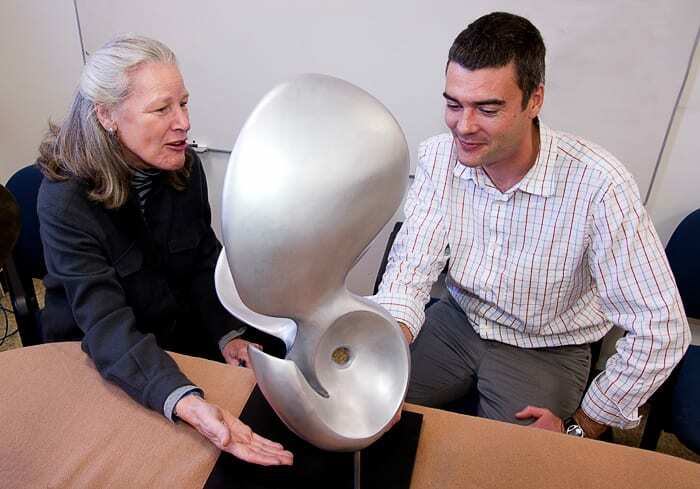 Kavanagh and Lawson’s partnership began about a year into the project, as the artist tried to figure out how to express the plight of pteropods through sculpture. When she showed him photographs of the scale models she had carved, Lawson instantly recognized them as pteropods. He offered to collaborate, believing that art exhibitions grounded in science provide an interesting form of scientific outreach. Pteropods are widely distributed in the world’s oceans and in many regions are a key food source for higher level predators, including commercial fishes such as salmon. Lawson is studying the distribution, movements, and ecological role of pteropods. In particular, he is investigating the impacts on pteropods from changing seawater chemistry associated with continued increases in atmospheric carbon dioxide (CO2). The continuing buildup causes more of the gas to dissolve into the ocean, making seawater more acidic than it currently is. Pteropods’ ability to make shells may be highly sensitive to changing seawater conditions. The shells are made of aragonite (calcium carbonate), and as more CO2 is dissolved in the ocean, less carbonate is available for making shells. Lawson’s lab and collaborators are employing a suite of sophisticated devices to sample pteropods and seawater chemistry simultaneously. In fall 2011, they completed a survey of the northwest Atlantic from the Sargasso Sea to waters off the Grand Banks, using nets and acoustic, optical, hydrographic and chemical sensors, as well as a video plankton recorder (VPR), an underwater video camera-microscope that enables researchers to take a unique look at the animals while they are actually living in the ocean, rather than in a lab. As they analyze the data collected from that expedition, they are planning a summer 2012 voyage in the northeast Pacific to conduct similar studies. Kavanagh’s sculptures, some hundreds of times the size of an actual pteropod, depict the marine animals in various stages. The healthiest seemingly float with “wings” outspread, while the stressed ones are depicted with folded wings and pitted shells in a downward freefall, decaying from the effects of ocean acidification. 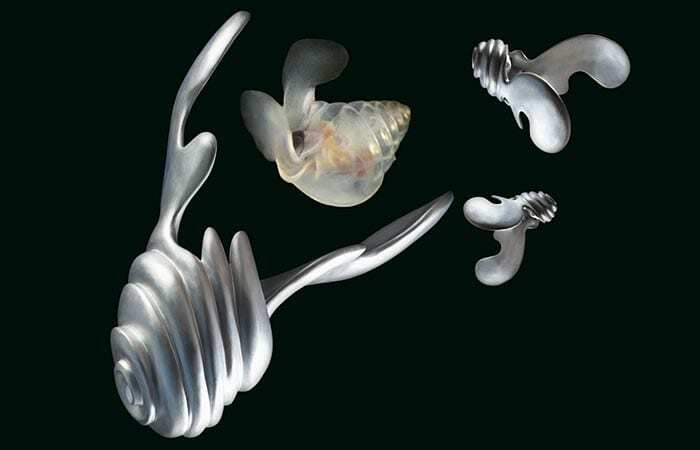 “The Pteropod Project: charismatic microfauna” by Cornelia Kubler Kavanagh runs May 22 to June 16 at the Blue Mountain Gallery, 530 West 25th Street, New York. On Saturday, June 16, Lawson will speak with gallery visitors about his work. Gareth Lawson’s current studies of pteropods are funded by the National Science Foundation and WHOI’s Ocean Life Institute and Access to the Sea Fund.